Baby rooms murals. 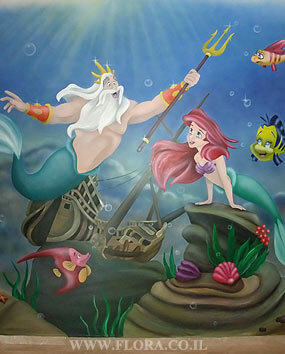 The Little Mermaid Ariel and King Triton were drawn In the center of an Undersea Kingdom. In the background we can see the sunken ship, images of Sebastian, Flounder and other residents of the Underwater Kingdom. The wall was designed by drawing the characters from the «The Little Mermaid – Ariel`s beginning». Drawing size: 4 meter. Ashdod. Muralist: Flora.